The VIP Crate - a variety of our gourmet pecans with other Mississippi favorites! 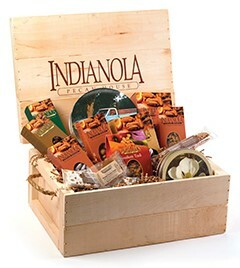 This wooden crate, with its distinctive Indianola Pecan House logo on the lid, is filled to the brim with Southern Gourmet delights! We’ve included our 7-flavor Pecan Sampler packed in this year’s Collector’s Tin, a 12-oz. box of Southern Pecan Halves, a 4-oz. Pecan Log Roll, 4-oz. of Pecan Divinity, a 12-oz. box of Praline Pecan Halves, a 4-oz. box of Cajun Roasted Pecans, a 5-oz. box of Crunchy Praline Pecans, a 5-oz. box of Chocolate Covered Pecans, a 5-oz. box of Bourbon Praline Pecans, a 5-oz. box of Key Lime Pecans, a 6-oz. box of Southern Trash, and one handmade Southern Praline. We top it off with our 13-oz. Magnolia Tin filled with Magnolia Crunchies. This makes a truly magnificent gift for that special V.I.P. on your list.